Claims pop up with frequency that this team or that invented the pitching rotation. These find life in our modern media and attract proponents. Thanks to David Smith, Tom Ruane, and scores of volunteer researchers, we have Retrosheet, and there are methods to determine rotation patterns and fact-check such comments as one spoken by New York Mets announcer Keith Hernandez during a recent televised major league game. Hernandez asserted the 1969 world champion Mets were the first team to use a five-man pitching rotation. Here’s how to check that. Let each game be assigned a number that ends a count of consecutive games featuring a different starting pitcher. This number is the rotation number (ROT) for that game. The string of ROT numbers that accompany a team’s season game logs indicates the level of rotation use. These you can sum and average for a team, a player, a season, a month, a league, or a decade. The 1969 Mets’ season ROT is the mean average of the team’s 158 rotation numbers. Until a team’s rotation is established, do not count the first few games of a season: the Mets’ first four games are not counted. The Mets played their games using five different pitching rotation cycles and these span from two-man use to seven-man cycles. The Mets’ quantity of starts in each rotation category distributes as follows across that spectrum: 3, 10, 44, 76, 21, and 4. The season ROT for the 1969 New York Mets is therefore 4.72. Now take a look at the ROT spectrum for the Tigers: 1, 9, 43, 74, 20, and 5. Detroit’s ROT is higher: 4.78. If you think I’m splitting hairs to debunk Mr. Hernandez’ claim, consider this: the numbers are from the 1925 Tigers. There is a lot more going on in the history and evolution of pitching rotations than generally acknowledged in contemporary accounts. Everything we think we know about days of rest and pitching rotations had already been attempted by major league managers by 1925. I can’t suggest that everything we know about pitching rotations was accepted by major league managers in 1925, but it had been attempted. Nineteen- twenty-five happens to be a watershed year: the five-man cycle, used in 38 percent of all games, finally eclipsed the four-man cycle, used in 34 percent of all games. From that year until Wilbur Wood’s knee injury, the unnoticed sea changes in pitching rotation usage concerned the dangers of the three-man and the impossibility of the six-man. Since 1970 we’ve seen the painful, slow demise of the four-man cycle—even when an off-day provides an extra day of rest. In 2010, 450 games were played with a four-man ROT: the lowest major league total since 1895, so the sea change continues. Strikingly delineated are the different pitching rotation eras. Upticks in two-man usage in 1879 and 1880 led to six years of prevalent use. From 1887 to 1897 the three-man won the day, and from 1898 to 1924, a period of twenty-seven years, the four-man won the plurality despite never exceeding forty-six percent of all starts. In 2010, the five-man was used in over 80 percent of all starts for the first time in history. Let’s take a look at each pitching rotation and its own history. ROT figures stay constant and don’t exceed 1.14 in the National Association years, but days-of-rest changes are dramatic. Days-of-rest has never been satisfyingly calculated because virtually all pitchers, at one time or another, sit out a few starts. Upon their return, player and team days-of-rest are skewed off chart. Buffalo in 1885 has the lowest ROT figures in the majors yet ranks high in days-of-rest because pitcher Pete Conway sat 79 days before his August 10 start. Conway’s long hiatus had nothing to do with the pitching rotation, but the well-intentioned statistician is pressured to include it. Another 1885 pitcher—The Only Nolan—was rested over 50 days; dozens more were “rested” over 10 days. Brilliant standing work on this subject is by John Rickert, Associate Professor of Mathematics at the Rose-Hulman Institute of Technology. Posted January 2008 on SABR-L, Rickert’s data— calculated by ignoring actual days-of-rest of 11 or more—shows MLB pitchers resting an average of four days per start as early as 1900. Note how meDOR’s track about 0.89 behind ROT’s after 1905. That’s because 1905 was the first year off-days accounted for nearly 11 percent of the schedule, the figure used today by MLB. As it turns out, National Association days-of-rest was more reasonable than many would think. In 1871 the average team played a schedule of 28 championship games in 147 calendar days. That’s 4.2 off-days for every game and an ROT of 1.03, numbers that produce a first season meDOR of 4.28—higher than any season since. 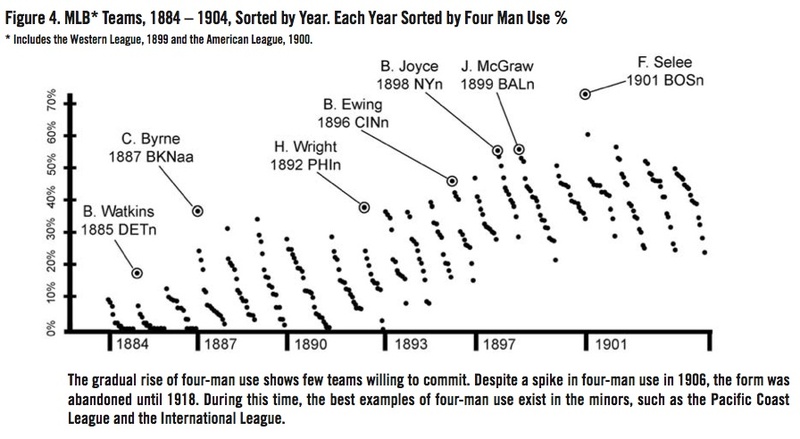 In 1880, for the first time, there were more games played during a season than there were off-days, and this trend, combined with an apparent rise of fast ball pitching in 1877, were likely the driving forces in the origin of pitching rotations. Origin: 1879 Springfield (MA) NA, Robert Ferguson, manager and captain. First Team: 1881 Chicago NL, Adrian “Cap” Anson, manager and captain. Cherokee Fisher is spelled as a starter with both Baltimore in 1872 and Hartford in 1874, but these incidents are spotty and probably reflect an overall unreliability on Fisher’s part. In 1875 Robert Ferguson took over the Hartfords and, with Lipman Pike as the captain, sometimes alternated veteran Candy Cummings with rookie Tommy Bond in the second half; Boston’s lead was too big to overcome. But it was the advent of the International Association in 1877 that brought real change. This league condoned higher-arm fastball pitching and saw a number of teams hand 20 percent of their starts to secondary pitchers. Utica’s 1878 “Joyful Nine” under James Gifford finished in third place by alternating two outfielders: Blondie Purcell and Nick Alcott, for a 1.47 season ROT, the highest to that point by a team that finished over .500. On August 20 of that year, Springfield’s Larry Corcoran walked out of the pitching box in a game against Worcester with a sore elbow. Fred Goldsmith was signed from the London, Ontario “Tecumsehs” to fill the gap. In 1879 the two made Springfield the first team to score a 1.50 ROT. Manager Robert Ferguson became ill in June but his replacement, Lipman Pike, kept the two pitchers alternating. In the NL, George Wright managed and captained Providence to the 1879 pennant with an interesting 1.33 second-half ROT, with Bobby Mathews being used to give John Ward extra days of rest. In the National Association, Springfield disbanded September 6, ten days after their last regular season game. Corcoran and Goldsmith were signed by the Chicago Nationals within a month. Chicago’s leader—Adrian “Cap” Anson—would win the pennant in 1880 but Chicago’s ROT score was 1.41—marginally better than the Buffalos’ 1.35. More regular Corcoran and Goldsmith alternation in 1881 gave Anson the second of three straight pennants and a never-before-seen ROT of 1.89. Identifying the 1881 Chicagos as the first team to use the pitching rotation is probably not news to SABR membership. Jim Mutrie assembled the strictest two-man pitching rotations. His pennant winning 1884 AA Metropolitans used it in 87 percent of their games, a mark topped only by his 1886 New York Nationals, who used it 93 percent of the time. This included one stretch where Tim Keefe and Mickey Welch alternated for a record 44 consecutive games. Origin: 1881 Mets, Eastern Championship Assn., Jim Mutrie, manager. First Team: 1887 St Louis AA, Charles Comiskey, manager and captain. The three-man came into use when season schedules incrementally expanded, putting pressure on two-man staffs. It pops up in 1881 when Jim Mutrie’s semi-independent Metropolitans became the first team to schedule 150 games. Jack Neagle worked as the third pitcher to two mutton-chopped Irishmen, the one-armed Hugh Daily and John Doyle. Major league schedules at that time called for only 84 games. In 1883 the three-man entered the NL as an option for second division teams with untested pitching prospects, and to this day, out-of-contention clubs will often add a pitcher to their rotations at the end of the season. In 2010, both Baltimore and Toronto used six-man September rotations. As noted by Rickert, six-man use actually spiked in 1998 as more teams were out of contention than in any other season. This had the effect of bringing meDOR for both leagues to over four days of rest per pitcher for the first time in history. The American Association upped its schedule to 140 games in 1886, removing 17 off-days from each team’s schedule. 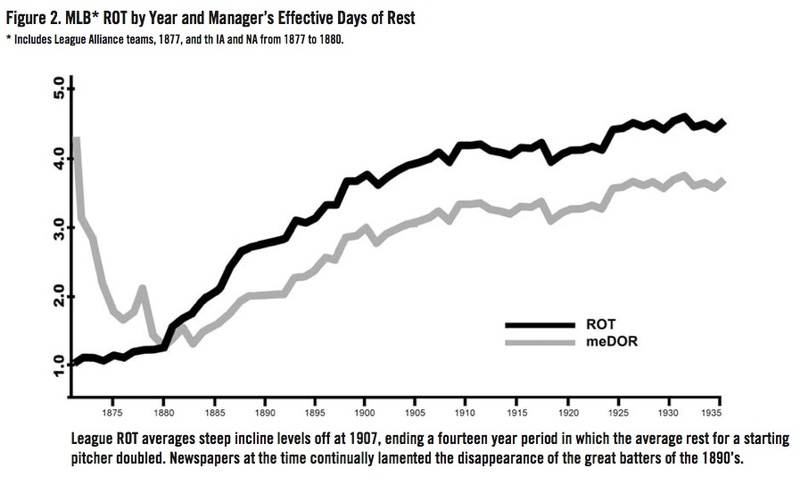 Comparing 1885 to 1886, Association days-of-rest dropped from 440 to 309 while three-man cycles doubled from 223 to 447. Three AA teams come close to its first committed use this season. St. Louis and Brooklyn almost pull it off, but both use the two-man for extended periods. Harry Stovey’s Athletics have, due to injuries, five pitchers in and out of a staggering amount of three-man cycles: 58 percent. Stovey, however, spent chunks of the season trying to work an archaic 2323 rotation. This meant Al Atkinson worked the “2’s” on one day of rest while two pitchers took turns working the “3’s” with three days of rest. In 1887, Charles Comiskey’s flag-winning St. Louis Browns, Harry Wright’s contending Phillies, and Horace Phillips’s “Pittsburgs” all played over 50 percent of their schedules with three man rotations, and the contending champion Browns stand out. They had the earliest Spring commitment to the three-man and the necessary depth to make it work. Teams of that era with strong pitchers like Bob Caruthers and Dave Foutz universally forced them into two-man tandems. Bizarre circumstances in mid-August led to three weeks of one- and two-man use: Dave Foutz dislocated his thumb, Nat Hudson’s mother died, and Bob Caruthers got food poisoning. That’s when Silver King won three consecutive starts in three consecutive days, something no pitcher has done since. But the kind of consensus that swept the two-man into acceptance didn’t happen with the three-man: both 1888 World Series participants, the Giants and the Browns, were last in three-man use in their respective leagues. Frank Selee’s 1890 Boston Nationals were the most committed team to the three-man agenda, a decision no doubt spurred by Boston’s failed use of the one-man rotation in September of 1889. The 1890 Bostons featured John Clarkson, Kid Nichols, and Charlie Getzein, and nearly overtook the Brooklyns with three weeks to play. Brooklyn, led by smart Bill McGunnigle, won the pennant when rainouts helped the team get away with a two-man rotation during the season’s final weeks. The 1892 Louisvilles’ stretch of 39 consecutive games using a strict three-man seems to be a record that will not be broken. The three man continued to be a tool of the major league manager until 1969. Leo Durocher’s Cubs used it 36 times that year—twice the frequency of the 1964 Phillies—and Chicago came down harder and sooner. Nineteen-sixty-nine didn’t usher in the five-man rotation as many have come to believe. It proved, once and for all, the fallacy of winning with a three-man. Origin: 1885 Detroit Nationals, Bill Watkins, manager. First Team: 1901 Boston Nationals, Frank Selee, manager. On June 14, 1885, Bill Watkins, manager of first-place Indianapolis of the Western League, made a deal with last-place Detroit of the National League. Watkins would abandon Indy and the Western League and sign to manage Detroit, bringing along with him a gaggle of Western League players. Among those were left-handed pitchers Dan Casey and Charles “Lady” Baldwin. Watkins combined Casey and Baldwin with Detroit’s existing pitchers, George Wiedman and Charles Getzien, to create the first four-man staff to rotate ten consecutive games. Detroit’s record was 11–34: they went on to win 9 of 10. Alas, Watkins discarded the rotation and used hunches to pick from his pool of pitchers the rest of the season. On May 17, 1886, Robert Ferguson debuted as manager of the Metropolitan Association team. He turned a two-man staff into a three-man and, in the final games of a September home stand, leaned primarily on a four-man rotation. The team won 7 of 10 forcing Baltimore into the cellar. The following year, in 1887, Ferguson had to open the season without staff lynchpin Jack Lynch. Ferguson used a 2323 in the early going: Al Mays was the strong arm while pikers Ed Cushman and John Shaffer alternated on three games of rest. When Lynch finally joined the team on May 20, Ferguson switched to the four-man, but it was too late. The Metropolitans were in last place and Ferguson was fired ten days later. Captain Ed Swartwood’s 1887 Brooklyn Association team, owner-managed by Charlie Byrne, enacted the first real effort to honor three days of rest for each pitcher. This goal was met in 76 percent of their schedule by tacking on fourth starters for fifty games. Brooklyn became the first team to crack the 3.00 ROT; their 3.26 ROT was actually higher than the 1908 White Sox. A poor season finish led to an apparent abandonment of the policy the following year. If only they had checked their own 1887 game logs: a 1–2 (.333) record in 1 ROT starts; an 8–13 (.381) record in 2 ROT starts; a 22–32 (.407) record in 3 ROT starts; and a 20–23 (.465) record in 4 ROT starts. Over the next thirteen years, thirteen teams incrementally advanced four-man use (See Figure 4). These trail-blazers included the 1888 Indianapolis Nationals, the 1889 Chicagos, the 1892 Phillies, and the 1896 Baltimore Orioles. The Orioles, managed by Ned Hanlon and captained by Wilbert Robinson, were the first team to surpass a 4.00 ROT score (4.04); the first team to avoid using the same starting pitcher twice in any three-game stretch; and the first pennant winner to use a plurality of four-man starts (42 percent). Expanded roster sizes during the 1901 AL-NL war provided the impetus managers needed to give the four-man due consideration. That year three teams made serious bids to be first in this category. The Philadelphia Phillies, captained by Ed Delahanty and managed by team director Bill Shettsline, used the four-man 78 percent of the time from April 29 to August 20: Red Donohue, Al Orth, Bill Duggleby, and Doc White. Hugh Jennings took over the captaincy mid-year and used the five-man 29 times late in the season in what appears to be “double-header patching”—a temporary rotation increase by one starter so that days-of-rest for regular rotation members remains constant. The Phillies were a surprise second-place finisher. The Baltimore Orioles, from June 20 to August 20, ran a four-man 84 percent of the time. Manager John McGraw likely deferred the handling of his pitchers to team captain and friend, Wilbert Robinson. The four- man was adopted in June when ace Joe McGinnity lost a few starts and the team dipped under .500. Jerry Nops joined McGinnity, Harry Howell, and Frank Foreman until injuries and controversy destabilized the team and the rotation in a September free fall. You’ll notice I referred to McGinnity as the “ace” of Baltimore. ROT calculated for individual pitchers provides a quantitative definition for an often frivolous appellation. Managers bump up aces by a game or push back fifth and sixth starters. You’ll recall some aces pitch the game before the All-Star break, and then the game after—Dan Haren and Justin Verlander did that this year. These managerial moves accumulate over a full season and impact individual pitcher ROTs. McGinnity had the lowest ROT of Baltimore’s 1901 regular pitchers: 2.86. That’s 0.36 below the team ROT and indicative of a pitcher bumped up one game about 20 times. Interestingly, in a four-man rotation, every four times an ace bumps up, he adds a start to his season. On the Fourth of July, 1901, manager Frank Selee began a strict four-man rotation to help save the Boston Nationals in what would be the last of his 12 seasons at the team’s helm. Boston had used a fuzzy four-man in the early going. From the nation’s birthday on, Selee enacted a 90 percent four-man with Vic Willis, Kid Nichols, Bill Dineen, and Togie Pittinger. Selee patched doubleheaders in June with fifth starter Bob Lawson, but got lucky at the end of the season: off-days helped keep the four-man going through most twin bills. Boston is the first team to use the four-man in 20 consecutive games and at one point used it in 43 of 45 games—a pace unapproached by the 1971 Orioles. Boston finished the season with four-man use in a record 101 games, or 73 percent of their season. Selee deserves a medal for finishing at .500 but he was dispatched out of town without regret. Brooklyn put together a four-man staff worthy of mention early in 1902, but subsequently the form went into hibernation for 16 years. During this time managers, apparently, used tea leaves and magic dice to pick a pitcher for a day’s game. For long stretches, Rube Marquard couldn’t pitch on Fridays; Doc White couldn’t pitch in Washington, and Herb Pennock couldn’t pitch against Cleveland. Ed Barrow’s Red Sox resurrected the rotation idea in 1918 with a solid four-man that took the pennant. Their Fall Classic opponents, the Cubs, had the best four-man usage in the senior loop, making the 1918 Series the first between the top two four-man rotations from each league. It seems major league managers took notice. Seven teams during 1918 switched to four-man use mid-season. Origin: 1889 Chicago Nationals, Adrian “Cap” Anson, manager and captain. First Team: 1928 Chicago Cubs, Joe McCarthy, manager. On July 9, 1882, at Louisville, the St. Louis Browns presented recently signed Morrie Critchley in the box. It was the first time in big league history that five different starting pitchers were used in five games. But this was no pitching staff strategy; captain Ned Cuthbert’s top pitchers were injured and the team was in a panic. Similar stories mark the next five scattered incidents of fifth-pitcher use. In 1886, the Cincinnati Red Stockings accounted for eight five-man turns in one season as they grasped for the right three-man staff. These fumbling mid-season periods of pitcher tryouts just don’t qualify as candidate dawns of the five-man rotation. The first team to stock its bullpen with five quality arms and use them in an effort to contend was Cap Anson’s 1889 Chicago Nationals. Anson’s 1889 team peppered its schedule with 15 sparse occasions of five-man use, 11 percent of their schedule, a record mark nearly doubling Cincy‘s 1886 use. This included four consecutive five-man turns as the team jostled in the early May pennant race pack. The team set a new ROT record with a 3.33 mark, even though Anson gave up five-man cycles after July 20. He adopted three-man with Bill Hutchison making 14 starts as the “2” of the 2323 rotation. 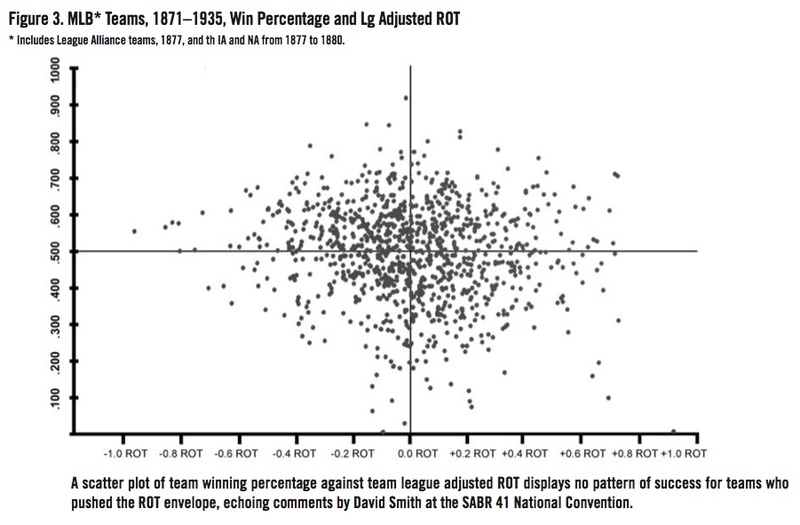 Between 1889 and 1930, 71 teams incrementally advanced five-man use across a swath of rotation sensitive statistics. For a few of these teams, five-man use is noticeably more than incremental. The 1896 Baltimore Orioles, already a noted participant in four-man development, were the first to play over 20 percent of their schedule with five-man cycles. They presented a record setting five-man/three-man ratio of 0.8 (31 to 38). This is a key statistic as noted by Figure 1: most league-wide, post-1905, advances in the five-man are accompanied by a similar retreat of the three-man. Prior to 1896, the best five-man/three-man ratio was 0.2 by the 1895 Louisvilles (13 to 46). Buck Ewing’s 1898 Cincinnati Reds dropped the three-man and relied on the five-man in August to help them hold first place. But given more regular work, Bill Damman and Bill Hill won only three of 10 games, and Boston, using a four-man, breezed into first place for good. Ewing oversaw the team’s record-setting use of 40 five-man cycles (26 percent), and five-to-three ratio 1.1 (40 to 37). They were the first team to have more five-man cycles than three-man cycles. Then the 1899 Cleveland Spiders and 1900 Brooklyns reached a new mark in consecutive game five-man use: eight. Cleveland strung them up after Labor Day en route to a 20–134 record; Brooklyn did it in July en route to the pennant. 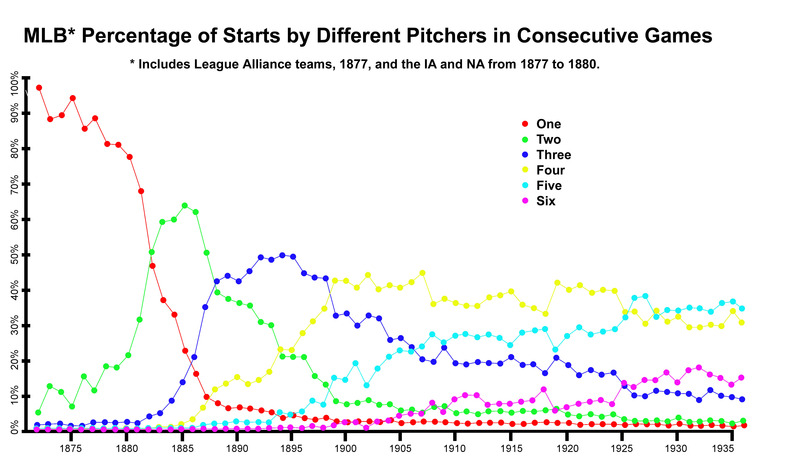 Baseball was still years away from the first five-man rotation. Interestingly, in 1900 Pittsburgh hosted Boston in a key four-game series ending the Fourth of July in which both teams produced five-man rotations. Pittsburgh swept, stayed above .500, and contended to September when they switched again to the five-man. On September 22, Fred Clarke broke this pattern and pitched Jack Chesbro on two days rest against sixth-place St. Louis. Chesbro was hammered and Pittsburgh lost a chance to pull to a half game behind the Dodgers. Six teams, including the minor league AL Clevelands, tried their hand with the five-man in 1900. But it was a fad; a way to get through the short term after which lower rotations would resume. The 1901 Phillies became the first team to use the five-man for 10 consecutive games and Ned Hanlon’s 1902 Brooklyns—the “Superbas”—upped that record by one and disdained the three-man enough to produce a five-to-three ratio of 3.7 (48 to 13). Patsy Donovan’s 1903 Cardinals were the first team to have the five-man as their most common rotation number, even though they only used it in one-third of their games. Ex-Baltimore Oriole Joe Kelley’s 1904 Reds were the first team with two different five-man streaks at least 10 games long. This appears to be double-header patching. In 1905 the New York Giants opened the season with a five-man. That’s when John McGraw built the big lead which carried them to the pennant. But June 10 he reduced Hooks Wiltse‘s role and finished the year with what you might call a fuzzy four-man. Fifteen years after the 1889 Chicagos, fuzziness was the word of the day. Strict rotation patterns for any rotation numbers vanish, as mentioned, until 1918. It was the dark ages of pitching. Pattern testing teams for rotation use during these years is like looking at 272 Rorschach tests: The 1911 Pirates... four-man? The 1909 Yankees... positively medieval. Rotation use in broad spans of seasons can be identified and measured by using Purity Scores. Purity Scores measure the tendency of managers to stick to a rotation over consecutive games. Take a look at the daily ROT numbers for the 1909 Yankees in August: 5645674545456745675654567. Now take a look at the 2010 San Francisco Giants, also in August: 5555555555555555555555555555. Subtract day-to-day changes in ROT, count the resulting zeros, and average the resulting positive numbers. Divide the quantity of zeros by games, and divide again by the average of the positive numbers to get the Purity Score. The season Purity Score for the 1909 Yankees is 13 percent. The season Purity Score for the 2010 San Francisco Giants’ is 94 percent. These two marks are, respectively, the lowest and highest in major league history. The 1902 to 1917 era has the lowest purity scores in baseball history. Helter-skelter patterns describe each team’s rotation use. Clouds of five-man use increase from 12 percent to nearly 30 percent in this period—all managers gravitating to five-man use as if pushing on a Ouija board. Tendencies for ROT pop up here and there: Connie Mack, with a few notable exceptions, had the league lowest ROT. Fitness-conscious Hugo Bezdek, in a short career, often ranked high. The most interesting use of the five man during this period was by Patsy Donovan’s 1907 Brooklyns and Bill Carrigan’s champion Boston Red Sox of 1915. That year both Boston and Detroit dabbled in late-summer five-man use. Boston made Detroit the second one-hundred game winner not to go to the post-season. The re-adoption of rotation use, and the abandonment of voodoo pitcher selection in 1918, put the evolution of the five-man rotation back on track. Wilbert Robinson’s 1920 Brooklyns were the first pennant winners to lead in ROT and five-man use. They also set a record with a five-to-three ratio of 7.9 (63 to 8). When the 1922 World Series became the first between two league leaders in five-man use, the stage was set for the development of the five-man pitching rotation. From 1922 to 1927, the New York Yankees led the AL in five-man use every year, sometimes by large margins. That’s a testament to the depth that characterizes the Yankee franchise to this day. Their reliance on four-man use and reluctance to patch doubleheaders with sixth pitchers makes them just a little archaic. Their advanced use of ROT over consecutive pennants gives them something in common with the Chicagos of the 1880s, and the Baltimores of the 1890s. Joe McCarthy’s 1928 Cubs display a staggering 5-to-3 ratio of 38.0, the greatest leap in any five-man measure for any major league team. This shattered the 8.6 ratio of the 1927 Tigers. McCarthy’s seemingly complete rejection of the three-man means his team, easily, is the first whose pitcher use could have been accomplished in our twenty-first century without raising eyebrows—significantly set apart from the Yankee teams of the day. Using ROT values to identify aces, Sheriff Blake leads the 1928 Cubs with a 4.59 ROT over Pat Malone’s 4.80 ROT. But Malone is saddled with 17 relief stints, so many that a calculated meDOR for him is virtually meaningless. This is a common plight for top pitchers in the 1928–1931 period. It is better explained in a history of relief pitcher use, and better explains the high batting averages of the 1930s. These Cubs, by the way, are the first to play a majority of their games with a five-man cycle. Heinie Wagner’s 1930 Red Sox opened the year with a near perfect five-man “rotation scheme” for the first 20 percent of the season. This countered baseball commissioner Kenesaw Mountain Landis’s decree that starting pitchers not be announced until game time, a measure adopted to thwart gamblers. The Boston Herald didn’t seem to notice the rotation until four weeks into the season. On May 12 they wrote: “The Big Five of the Sox... a pitching oligarchy of power and guile.” The Red Sox dropped the idea June 3 when they pitched Jack Russell on two days of rest. Boston had a 13–29 record and slouched deep in last place. They are the only team in this collection unable to contend. Gabby Street’s 1931 St. Louis Cardinal world champions had fewer five-man turns than the 1969 Mets, but, as mentioned, had more doubleheaders: 31 to 22. They countered this with massive, record-setting six-man use, a pattern also used by the 1932 Yankees. Eighty percent of the 1931 Cards’ schedule was played with a ROT of 5 or more, a huge increase over the 71 percent attained by McCarthy’s 1929 Cubs, and compatible with an average team from 1997. The 1932 and 1933 Cubs—a tribute to Grimm and Rogers Hornsby—advance the cause of the five-man and are subsequently followed by Joe McCarthy’s Yankees of the 1930s. Unperceived by all, especially the 1969 Cubs, the 1928 Cubs had let the horse out of the barn. Pitching rotation strategy is still unreported and tides of rotation strategy ebb to this day. The unreported strategy—or lack of strategy—of the new millennium is the mega5. Created by Bobby Cox in 1995, somewhat displayed by Joe Torre’s 1998 Yankees, and attempted by both 2002 World Series participants, Anaheim and San Francisco, the mega5 is a complete elimination of the four-man option for an ace—even after an off-day. With advanced grounds-keeping to minimize doubleheaders, teams can string together upwards of 50 consecutive games with 100 percent pure five-man work. Since then, 28 teams have put together mega5’s including three in the first half of 2011. On August 9, 2011, Milwaukee’s Chris Narveson cut his pitching thumb with scissors while lacing up his glove, ending the Brewers’ mega5 at 84 games. This left the team 12 shy of the record held by the 1995 Braves. It went unreported. FRANK VACCARO is a longtime SABR member and Teamsters Local 812 shop steward for Pepsi-Cola (KBI) in Northern Queens, New York. He lives in Long Island City with his wife Maria and their cat Furgood. 1. All information on game starting pitchers and ROT spreadsheets are sourced from Retrosheet. Accessed 12 August 2011. 2. Mark Liptak, “Interview with Wilbur Wood,” Baseball-Almanac.com, accessed 30 August 2011, www.baseball-almanac.com/players/wilbur_wood_interview.shtml. 3. The Sporting News, 10 June 1926, 4. 4. John Rickert, email to SABR-L Listserv. Archives, post 072962, 12 January 2008. 5. The Sporting Life, 22 October 1884, 3. 6. Springfield (MA) Daily Republican, 21 August 1878. 7. Chicago Inter Ocean, 4 October 1879. 9. Dennis Purdy, Kiss ’Em Goodbye, (Bristol, CT: ESPN Publishing, 2010), 117. 10. Jack Kavanagh and Norman Macht, Uncle Robbie, (Cleveland: SABR, 1999) 51. 11. Sporting Life, 17 April 27, 1901, 6. 12. Chicago Tribune, 23 September 1901. 13. Stan McNeal, “Scissors mishap will shelve Brewers’ Chris Narveson,” Sporting News Online, accessed 1 September 2011, http://aol.sportingnews.com/mlb/story/2011-08-10/scissors-mishap-will-shelve-brewers-chris-narveson.